John Mallee was working a White Sox youth baseball camp in the mid-1990s and supposed to warm up the crowd and introduce major-league coach Ron Jackson. Except Mallee kept talking to the point where Jackson saw something in the young guy who gave private hitting lessons to local kids. The opposing starter Maikel Franco had singled against the night before was tossing a football down the third-base line. Some of his Phillies teammates were stretching in shallow right field. Four hours before his 3-for-5, two-RBI night began, Franco stood at home plate taking soft underhand tosses from hitting coach John Mallee and launching them to the deepest parts of Citizens Bank Park. PHILADELPHIA — Maybe J.P. Crawford is figuring out a few things at the plate. 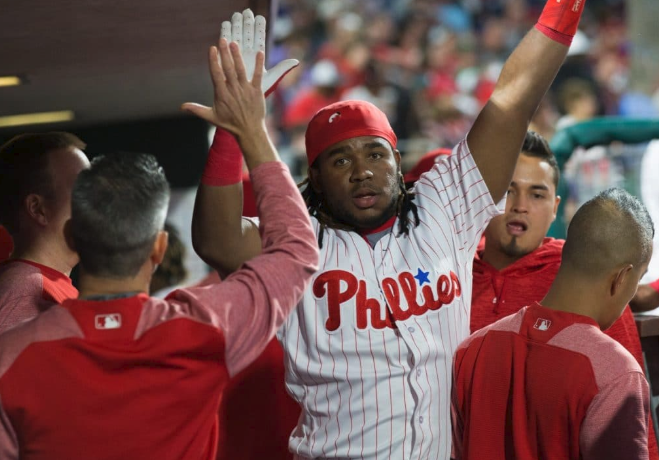 Crawford crushed a two-run home run into the second deck in right field in the second inning in Wednesday night’s 4-3 victory over the Reds in 12 innings at Citizens Bank Park. Crawford turned on a 0-2 fastball from Reds right-hander Luis Castillo, giving the Phillies a 2-0 lead. It was the first homer of Crawford’s career. The ball left Crawford’s bat at 105.2 mph, according to Statcast™. Crawford, who the got the ball, opened the season in a 1-for-25 slump before ripping a go-ahead single with two outs in the seventh inning in Tuesday night’s 6-1 victory. He has spent the past several days trying to shorten his swing. Crawford’s sacrifice bunt in the 12th inning also advanced Pedro Florimon to third base, setting up the game-winning run when Scott Kingery hit a sacrifice fly to right field. 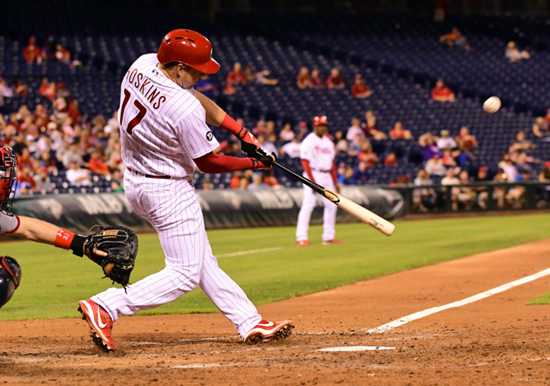 Phillies slugger Rhys Hoskins is one of the better young sluggers in the game, having crushed 18 homers in just 50 games in 2017, and he sat down with the Statcast™ Podcast to explain how he approaches life at the plate in the world of launch angle and exit velocity. For Hoskins, it’s not just about getting the ball in the air. It’s about having an approach that allows you to not have to be absolutely perfect every time in order to be successful. Even stars have hitters they want to be like. 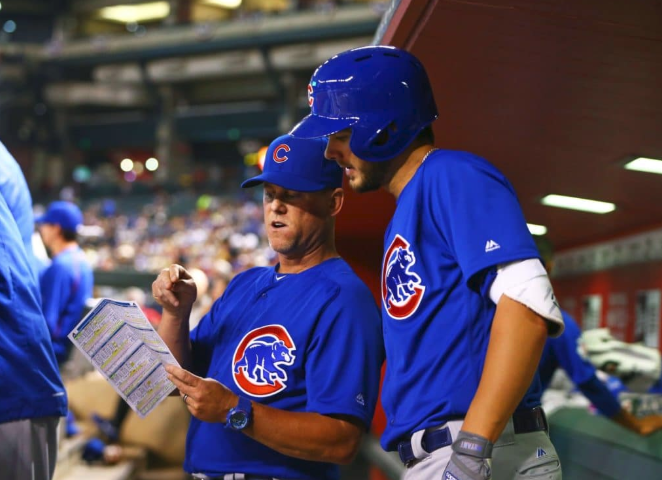 For Hoskins, the first names he mentioned were a pair of Cubs, in part because analytically inclined Phillies hitting coach John Mallee held the same job in Chicago for the previous three seasons. “There’s a couple guys on the Cubs that I watch a lot,” Hoskins noted. “Ian Happ and Anthony Rizzo, two guys that kind of have a similar leg kick to what I employ, also guys that Mallee has worked with, so it’s been really cool to hear him talk about them and their routines and what they go through. Those are two guys off the top of my head. Also on this week’s show, Mike and Matt dig into the early-season feats of Shohei Ohtani, who is setting Statcast™ marks on both sides of the ball. In addition, the show looks at early season notable Statcast™ metrics, including record-setting homers from Avisail Garcia, Marcell Ozuna and Giancarlo Stanton; elite velocity from St. Louis rookie Jordan Hicks; early looks on expected production from Jose Martinez, Miguel Cabrera and Yasiel Puig; Seth Lugolooking dominant in relief; Jorge Alfaro‘s cannon of a throwing arm; and the entirely predictable (and effective) move of Gerrit Cole to throw fewer fastballs with Houston. 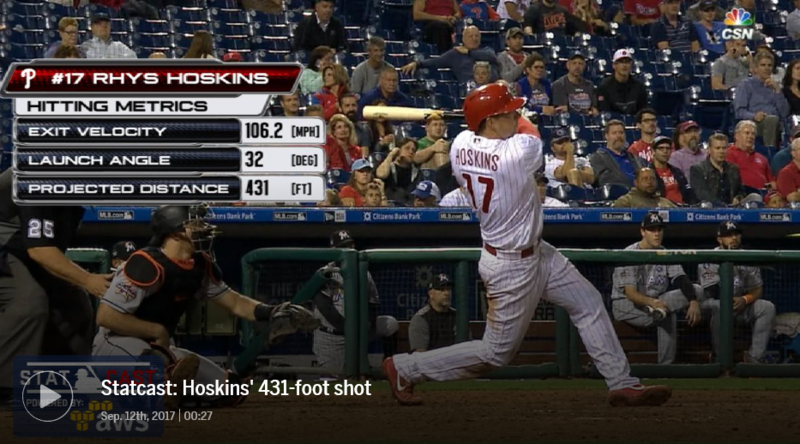 PHILADELPHIA >> Rhys Hoskins let two fastballs down the middle go for strikes and somehow saw another one. He crushed it. Hoskins hit a go-ahead three-run homer, Aaron Nola tossed seven impressive innings and the Philadelphia Phillies beat the Pittsburgh Pirates 6-2 Saturday. Nola (2-1) allowed two runs, six hits and struck out nine to help the Phillies win their third straight game and improve to 8-1 at home. The Pirates have lost five of six after an 11-4 start.